I've seen requests to export a whole Work Item for viewing outside the SCSM/Cireson sphere. 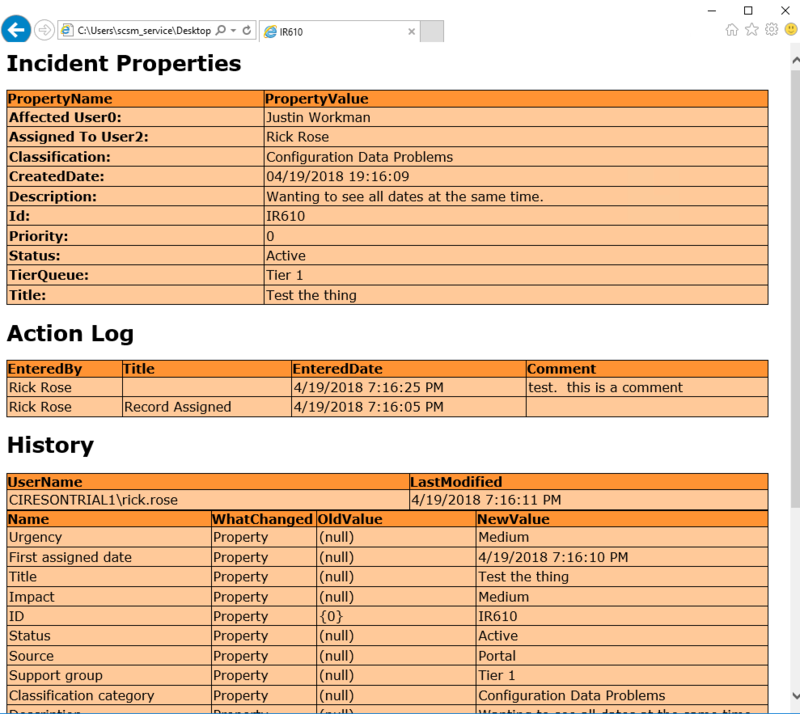 This powershell script will let you select all available properties as well as the Action Log and History and export it all in a nice, neat little html file on your desktop. That looks great. Could be very useful. Thank you Justin. This is great for when audit rolls around. This looks great @Justin_Workman!! Would it be fairly straightforward/possible to extract the attachments for the workitem as well as child MAs/RAs? These are great ideas for V2! As it stands now, you should be able to feed the child activities in manually and generate an html file for them as well, but I can definitely see having a checkbox for both child activities and attachments being beneficial. Version 2 is attached. 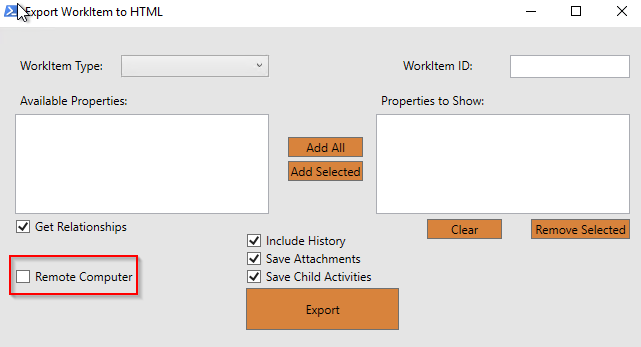 I've added the ability to export file attachments and child work items. All output is now directed into a folder for the Work Item selected in the UI but still on the logged in user's desktop. Thanks again @Jonathan_Boles for the great ideas! @Justin_Workman, now you're just showing off This is absolutely awesome stuff!!!!! I think this tool will incredibly useful for audits as well as deep dives on work items by managers looking for more info in a format readable outside of the portal. Thanks again for all the positive feedback. I really hope someone finds it useful. Shoutout to @James_Palmer for the initial inspiration and @Jonathan_Boles for additional features. I certainly considered that and may revisit this at some point in the future. Powershell is just more in line with my experience than JS at this point. However, I've been thinking...as most people probably want this for audit requests anyway, some of the base functions in this script could be re-arranged into a SCORCH or SMA runbook activity OR a Powershell Activity and then used with an audit request RO. Just submit the Work Item ID you need pulled and the automation could either email or just dump the results out to a share. Love this, but I have a suggestion for a future version: accept a servername as a param (or in a config file) so that it can be run remotely. Makes total sense. I'll try to add that ASAP. Here's version 3. The only addition is the Remote Computer option. 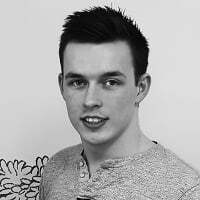 A word of warning: The Remote Computer bits will force queries to localhost if it's not set. So if you're not going to use it remotely, it might be better to stick with V2. If you do want to use it( @Tom_Hendricks I'm talking to you ) make sure the remote computer is set or it will query local machine. v3 works brilliantly when the remote computer is named. v3 all the way!!! The form, the powershell, the html - all slick indeed! Erm, excuse me @Justin_Workman ! How am I only hearing about this now. I have a feature request. What if it could pull this same data from DW. What we have here today is super useful but technically I can already get to these work items for audit through console or portal. However, I cannot pull this data out from DW for a single work item. Really nice work buddy and awesome to see you crushing the community. 3rd day of the month and already you have 66 points. Superstar! @Justin_Workman, this is great! Another future idea (feature request) I'll throw out there. Would it be possible to either A. 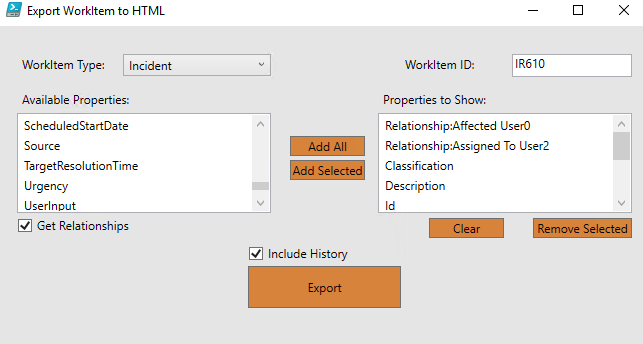 List multiple work item IDs that it processes as a batch (maybe separated by commas or by specifying csv with list) B. Provide the system a range of IDs to look for (ex: SR0001-SR9999) and it pull all of the relevant work items as the version does now for a single work item. TABS! That's right. Version 4 brings tabs with it. On the Multi tab, you can now export multiple work items at once. Select a date range and any work item(filtered by type from the drop down on the Single tab) will be exported to your desktop! No, no, no I won't litter your desktop with potentially hundreds of work items. They go into a handy "MultiExport" folder. Or if you need a range of work items from their ID numbers, you can plug in a starting number and an ending number and get every work item(once again filtered by the drop down on the Single tab) in between. No need for a prefix either, just the number will work. And finally, if you already have a list of Work Item IDs you need to export, you can point to a CSV and grab each and every one for export. @Geoff_Ross - I hear you calling for DW export. That will be the sole focus of V5. It is great to watch this continue to evolve. Keep up the good work, @Justin_Workman! Thanks for sharing this, it is quite useful. Great job Justin ! Tremendous work!! Anyway to get the Approval Comments into the Review Activity information? Thanks @Brad_McKenna for this great Feature Request! I've got it implemented into what I'm calling version 4.1. I've also added comments to credit all the feature requests in the code. Shout to @Geoff_Ross for suggesting uploading to github. I'm still thinking about adding DW! Thanks @Justin_Workman for the feature enhancement, much appreciated! Also...tremendous job on the Simple Print. I provided both of these to a co-worker who has been manually opening and printing tickets (crazy I know), and she was elated. Great work @Justin_Workman. This is something we have just started to look at to capture work items prior to archiving for audit purposes. Updated to version 4.2 today on GitHub. 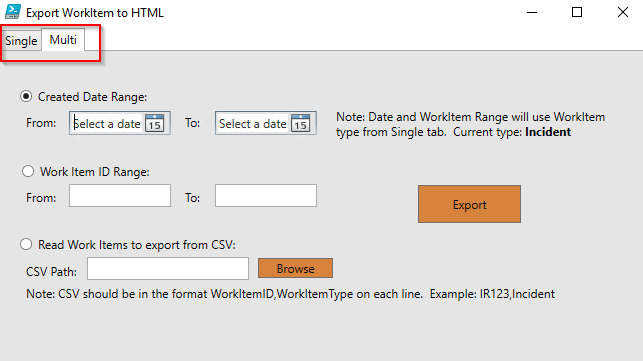 MultiExport work items are now organized by Date (YYYY/MM).